I was able to catch this movie with my mother, who agreed to see it because she wanted to annnnd because she wanted to get me out of the house for a surprise graduation party. 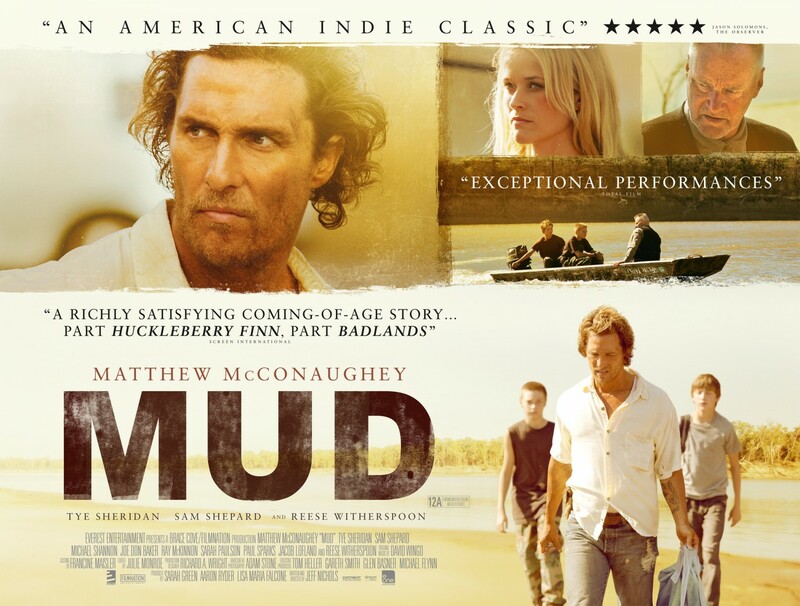 “Mud”, directed by Jeff Nichols, stars Matthew McConaughey, as Mud an individual on the run determined to reunite with his lover Juniper, Reese Witherspoon, despite the potential life threatening situation that both of them may encounter. Determined to meet her and stay on the low-down, Mud makes his home on a deserted island where he encounters Ellis, Tye Sheridan, and Neckbone, what an awesome name, Jocob Lofland. These two boys are determined to have the boat that Mud is living in or get the pistol that he is wiling to trade them, IF they help him build the boat. Ellis is instantly accepting of Mud while Neckbone is a bit more concerned with who this individual is. This acceptance is mainly due to Ellis’s current situation in which his parents Mary Lee, Sarah Paulson, and Senior, Ray McKinnon, are separating, because getting a divorce is much too expensive. Determined to prove that love is tangible and possible, Ellis decides to help Mud and Juniper reunite despite life threatening danger. Wow. This movie currently has 99% on rotten tomatoes and it deserves every damn percentage point it gets. Acting. Incredible. Story. Fairly original. It’s a combination of many things, Stand By Me, with a love story, but I mean what movie isn’t a combination of other movies and/or themes. Wonderful cinematography. Just a beautiful beautiful story. Tye Sheridan’s performance is worth mentioning because of how good he is ANNNNDDD how he manages to hold his own alongside such big wigs as McConaughey and Sam Shepard. His performance was extremely moving as well, allowing the audience to incorporate his own hopes and dreams alongside theirs. Even a jaded audience member, such as myself, wants to see love truly thrive in the end. Why can’t it be like that? Why? He also hits the notes with precision, Sheridan shows the audience his anger, his hope, his joy, as if he is really Ellis. Some of the best scenes with Ellis involve him just staring off in the distance. Hoping. Believing. Matthew McConaughey’s performance does involve him taking off his shirt, however, it is applicable in this movie. His southern drawl is like a smooth glass of whiskey in this movie. Seriously, him saying “Hell of a thing….” just gives me chills. The monologues he delivers were just awe-inspiring, ranging from the protection his shirt offered him to his youthful days with Juniper. I really think that if McConaughey continues selecting roles like this he will only get better and probably garner a few Oscars as well. Jacob Lofland as Neckbone also delivers. He had the posturing, the accent, and the execution of a rural southern boy. He became this logic ridden realistic kid who was willing to go along with Ellis, knowing full well that love doesn’t always play out in real life as it does in the books. I felt like I could really relate to this kid. He was steadfast and strong, loyal as a dog, and fairly smart. He just knew the right thing to do and did it and when he encountered something awful, he took it for what it was and didn’t become emotionally distraught, rather he acknowledged it and moved forward.